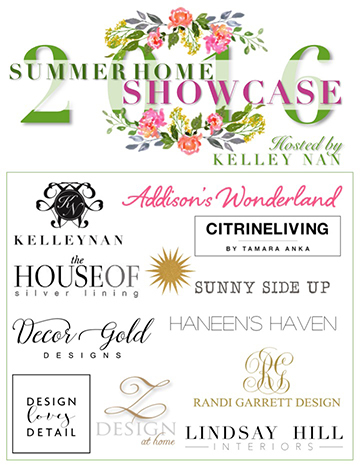 Welcome to CitrineLiving and the Summer Home Showcase 2016, hosted by my very good friend, Kelley Nan! 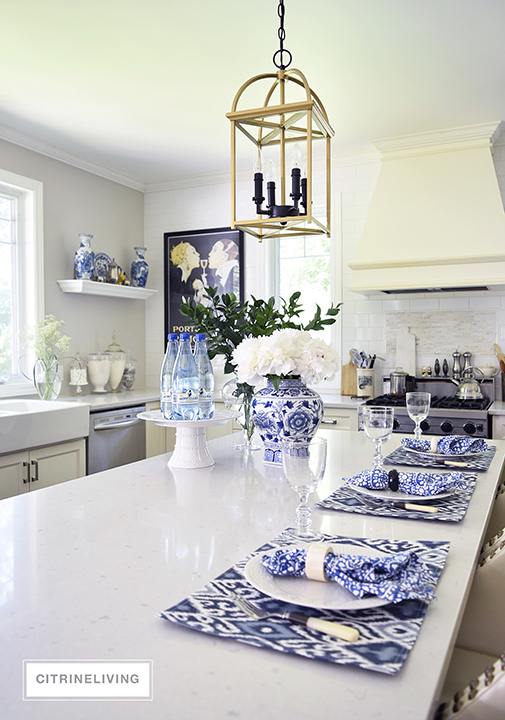 If you’re coming from Lindsay Hill Interiors, you must be completely wowed by Kathleen’s Summer tour – her home and design talent are outstanding. 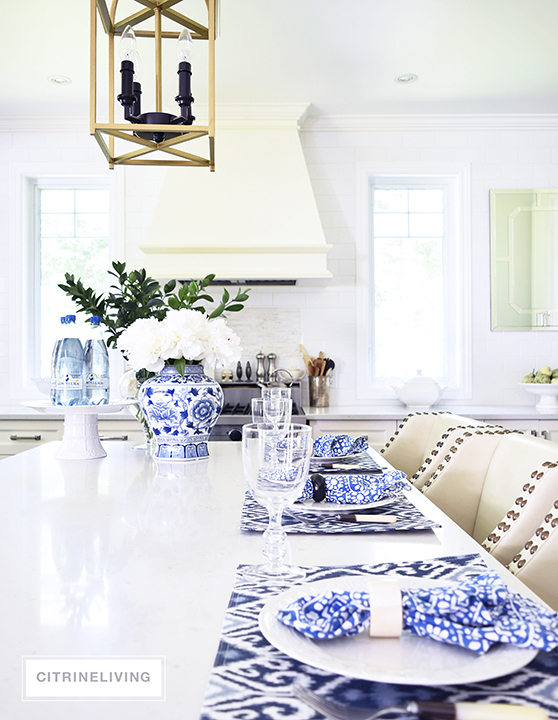 I’ve teamed up with a fabulous group of bloggers on this fun and inspiring Summer tour. Thank you so much for stopping by, and welcome to any new visitors! I hope you enjoy your stay – please feel free to kick back and make yourself at home. 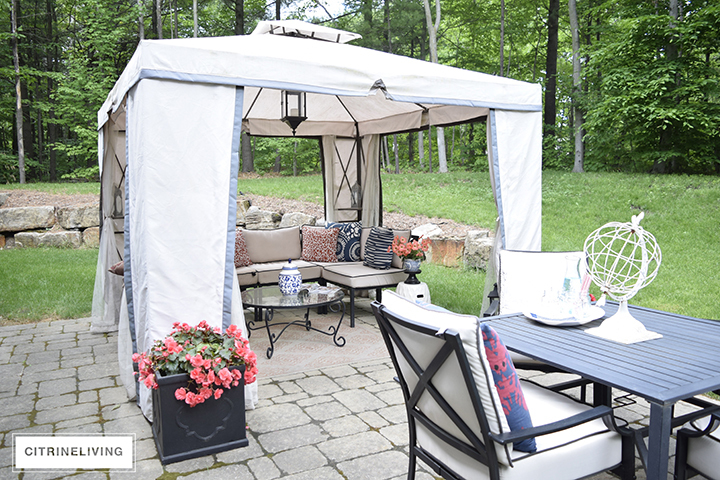 I’m starting off on our backyard patio – this is our favorite place to spend time together as a family when the weather heats up. It’s a modest size, but we love the the peace, quiet and privacy that we get back here. There are horse trails that run through the woods, along our property and it never gets old when we spot some majestic beauties on the trails walking by. We see them all year long, but in the summer we get to see them even closer and it really is such a treat. 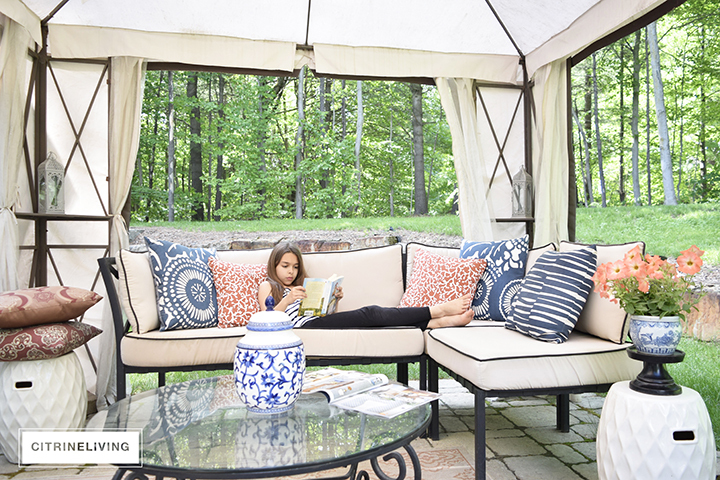 We love to relax, nap and read in our gazebo and I was lucky to get my daughter to pose for me when I was taking some of these shots – there’s nothing like lazy summer days, don’t you think? I recently shared our front porch and was planning on including an update in this post, but my peonies haven’t bloomed yet and unfortunately the weather hasn’t been warm enough to help my plants fill in the garden beds. 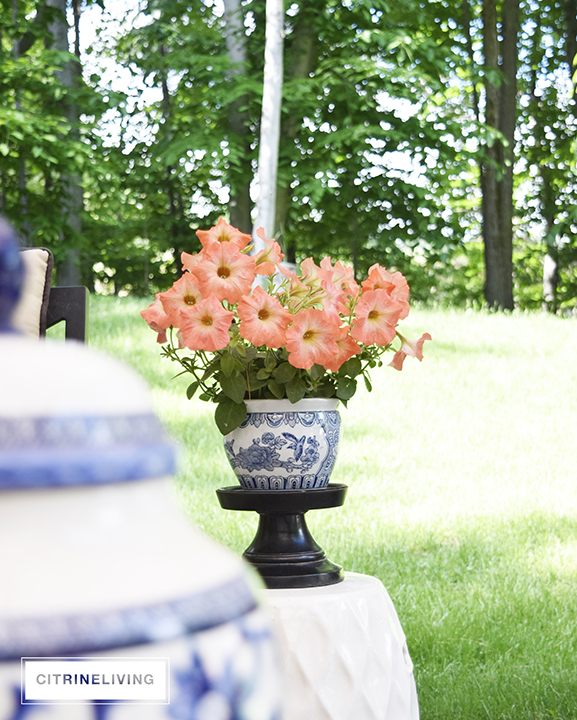 To see what we have in the front of our home, you can visit our front porch HERE. 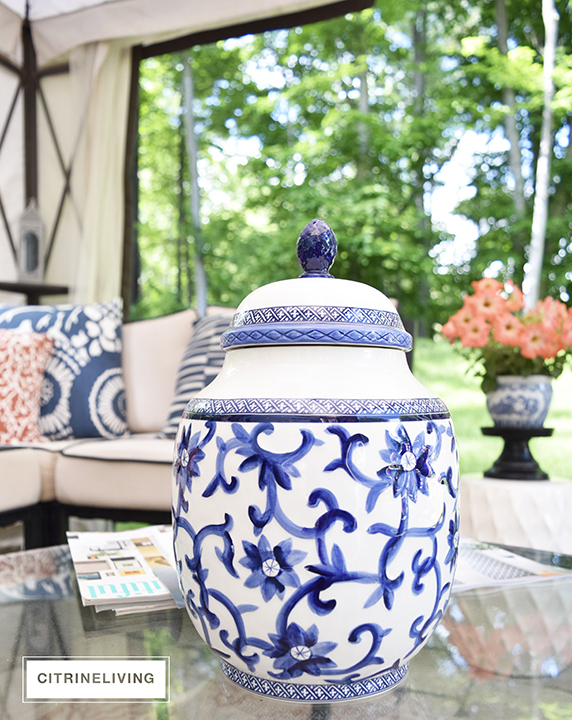 If you’ve been following along with me on Instagram, or here on my blog, then you know how much I love blue and white chinoiserie. I use it all year round and within most of my decor. So naturally, you’ll find it here today as well. 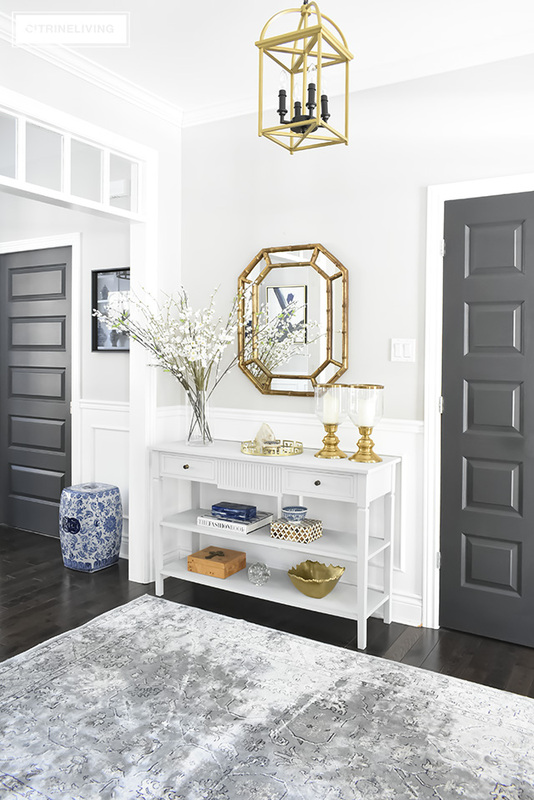 If you’re looking for ways to use it in your decor and aren’t sure how, it’s the perfect addition to summer decorating. I love to sprinkle it around our home and I’m always moving my collection from space to space. I like to try and use it in different ways as well, when I can. 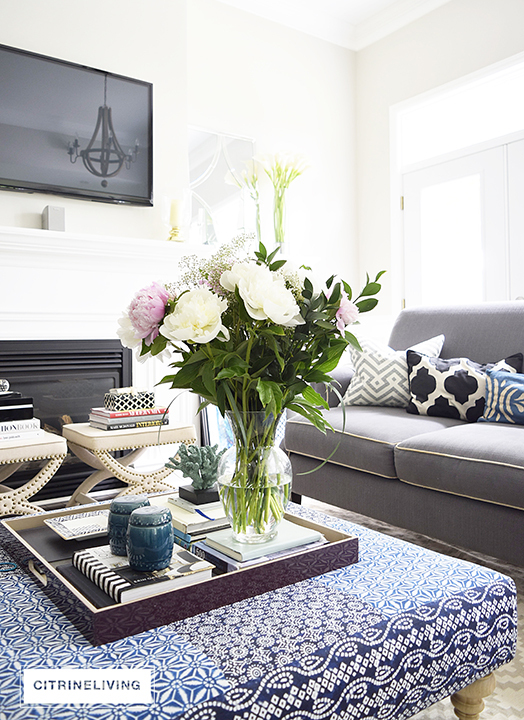 It sets the perfect stage for colourful potted florals and I hope to add some large blue and white planters to this space one day as well. I like to keep a refreshing pitcher of water nearby when we’re all outside. 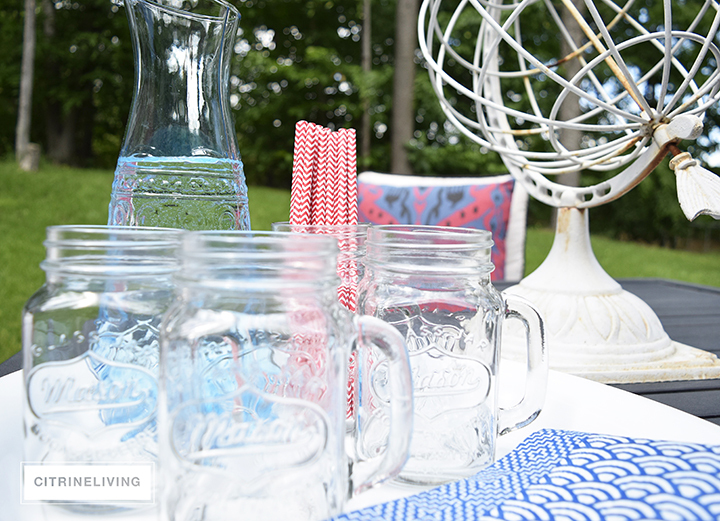 I picked up these mason jar mugs at the grocery store and I love them – they’re casual and nostalgic and perfect for outdoors. Fun printed paper straws and napkins are always a little visual treat and I love that they coordinate perfectly with my coral, red and blue color scheme out here on the patio. There are still many things we’d like to add back here and there’s a lot of work to do as well, but for now, it’s a peaceful little retreat that we love spend time and relax in. 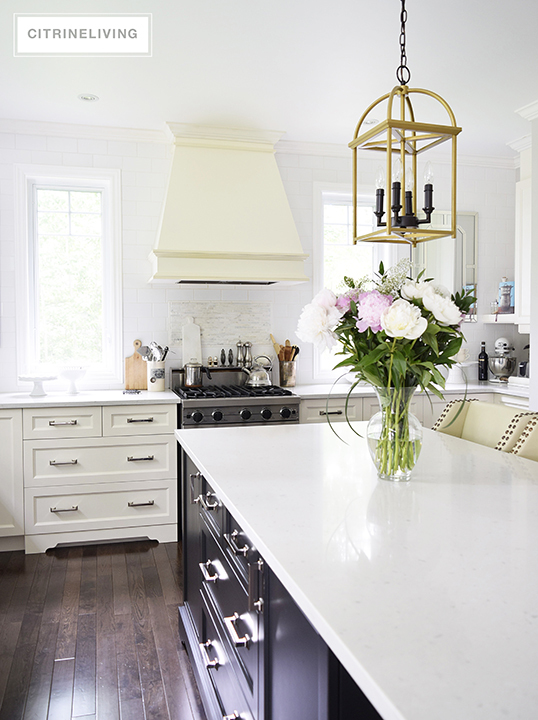 Come on inside to our kitchen – I love incorporating fresh flowers from the garden, especially my peonies. 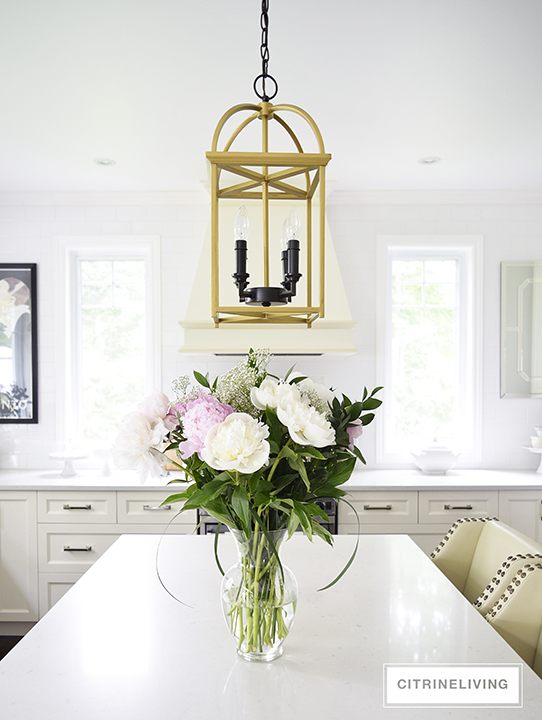 Since they haven’t bloomed yet, I went and bought some pink and white ones, along with some greenery, which I’ve used in a couple of different ways – you’ll see some different styling here in the kitchen, further down. We’ll come back to that a little later. I am no florist by any means and I actually find it a very big challenge to pull together an arrangement that looks effortless. 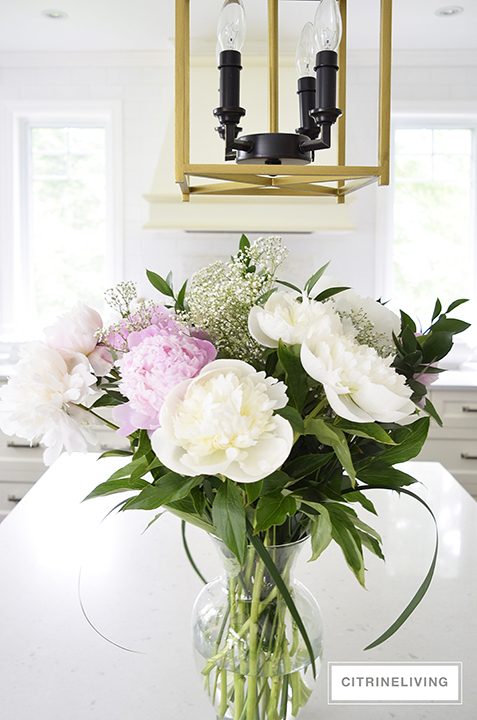 Before I separated the peonies by color, I had the white and pink arranged all together in one vase with a few greens and some baby’s breath. I used this full bouquet here in the living room as well for a few days before dismantling it and spreading them around. I took all of the bunches I bought after cutting the stems, and put them into my glass vase temporarily, until I was ready to separate them and use them in different spaces. I can’t believe how quickly they opened up – they went from closed, to full and fluffy like they are here, literally overnight! 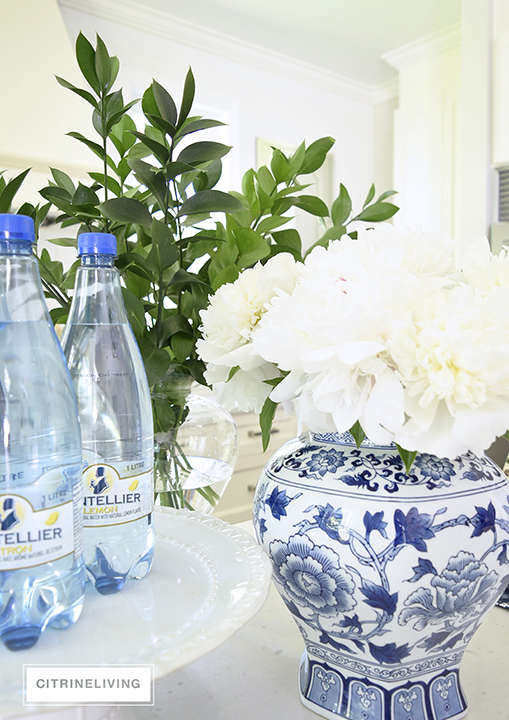 Someone recently gave me a tip : room temperature water encourages them to open up; to keep them closed longer, make sure to keep the water cold, as well as change it daily. I will definitely be trying that the next time to make them last as long as possible. Even though this was an ‘unintentional arrangement’, I think it’s pretty enough to warrant a few photos of it’s own. 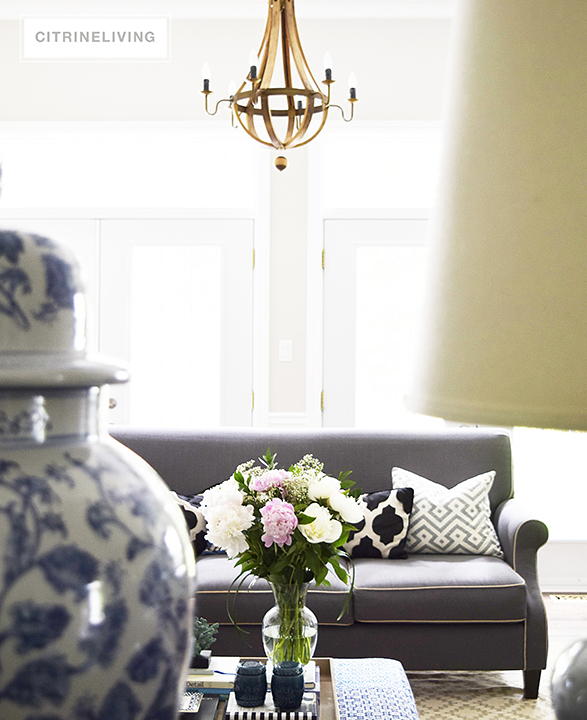 I typically wouldn’t add this shade of pink to this room, however I was really happy when I placed the vase here on the ottoman. 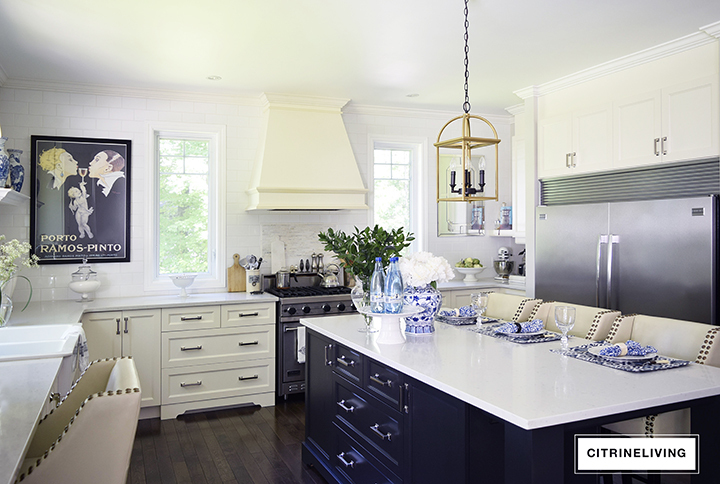 They add such a feminine and soft touch to an otherwise eclectic area. 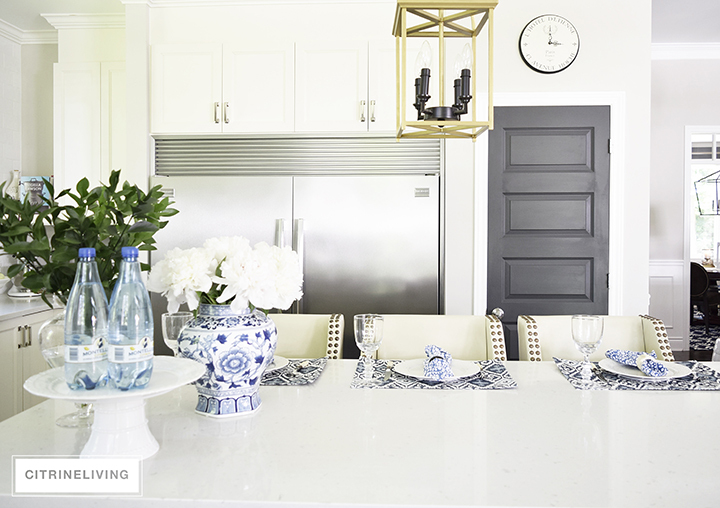 Back to the kitchen, I want to show you how I used the simple white and palest pink peonies with my layers of blue and white. 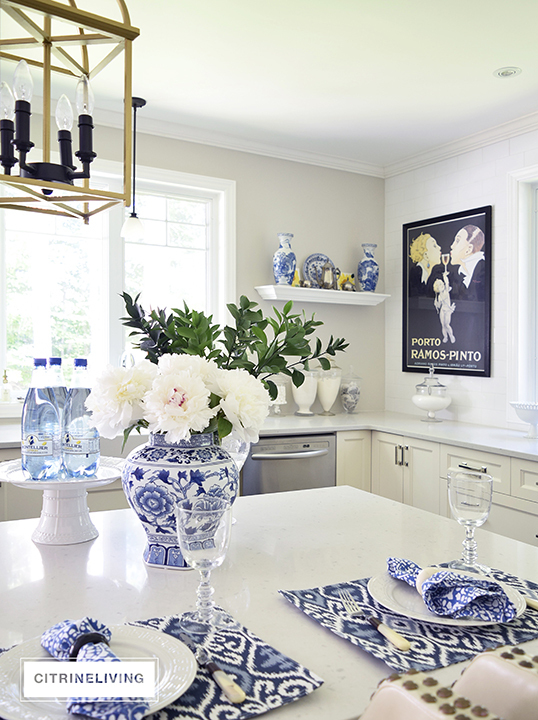 You can see how blue and white continue throughout this space and I use it along with many coastal elements (such as coral and shells) throughout the year as well, so when it comes to summer decor, I keep it pretty simple everywhere. 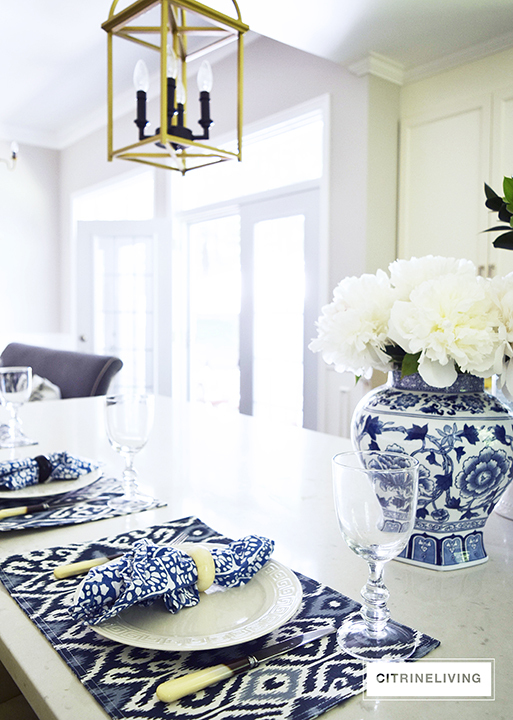 Here on the island, I’ve set a casual table, with layers of blues together with pattern on pattern – which is one of my favorite things to do – especially on tablescapes. 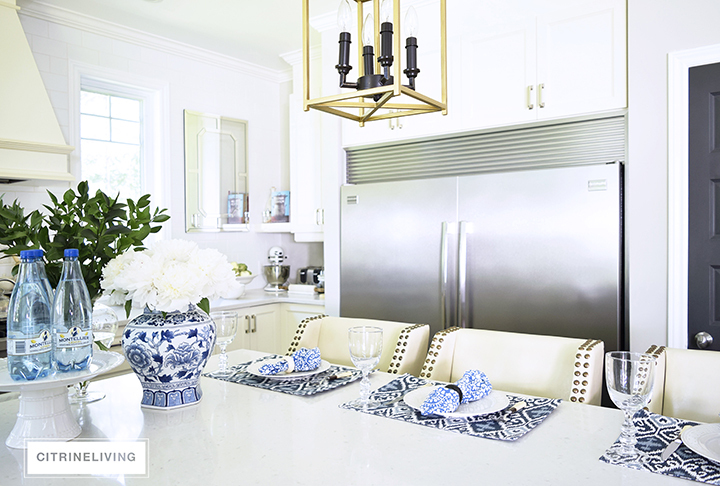 I love this classic color palette for it’s crisp and timeless elegance – you can never ever go wrong with blue and white. I have a pair of these ginger jars, and as I mentioned above, they move all over the house. 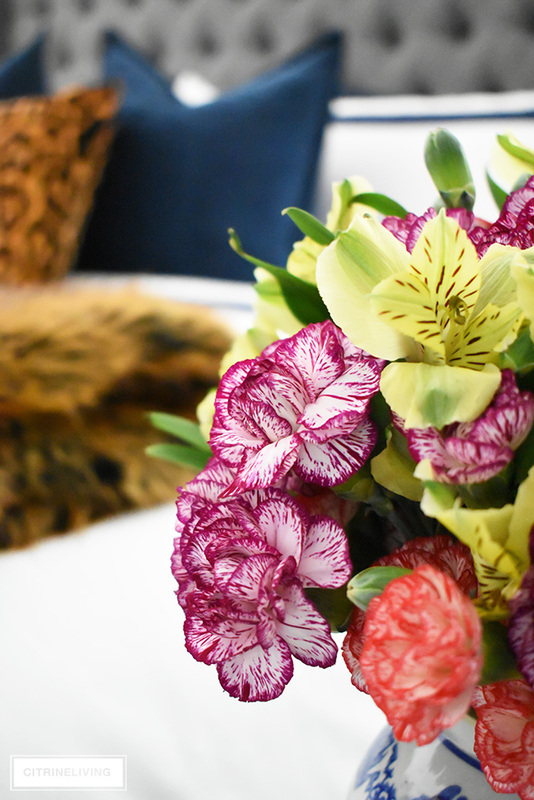 They’re perfect for arranging flowers, fresh or faux. 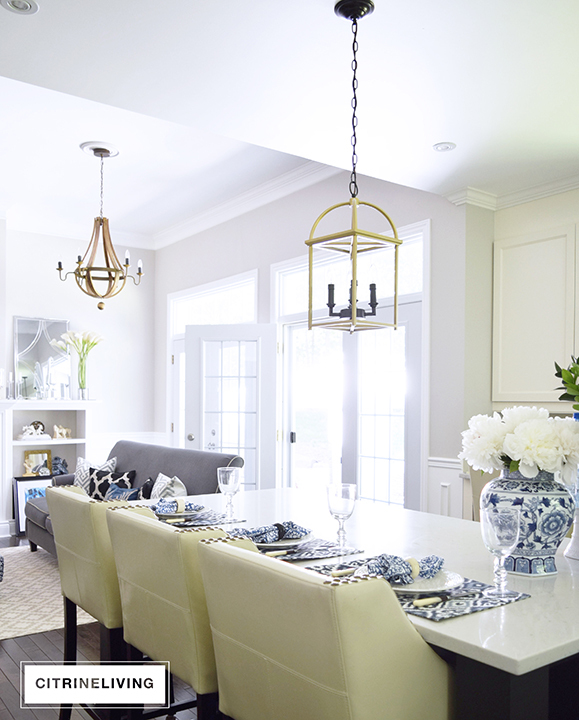 You can have a look at how I styled our dining room this past Spring, HERE, using all faux arrangements. I LOVE how the peonies look in this jar. 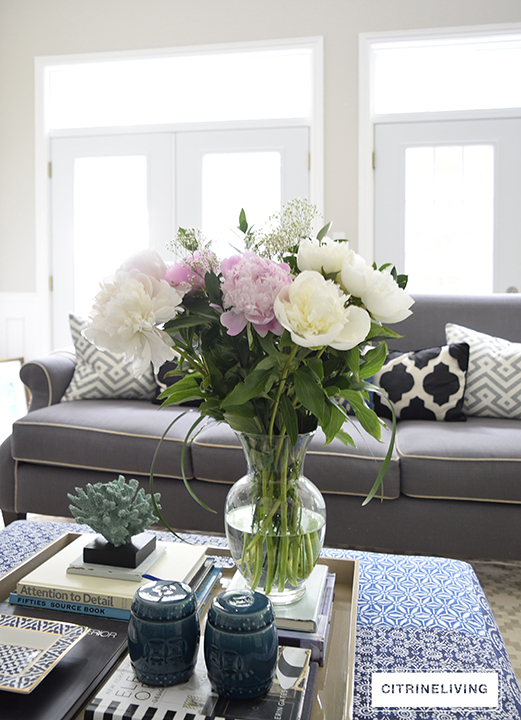 I think everyone loves peonies! They give off the most beautiful scent and you can smell them every time you come into the house. I think that says Summer more than anything! 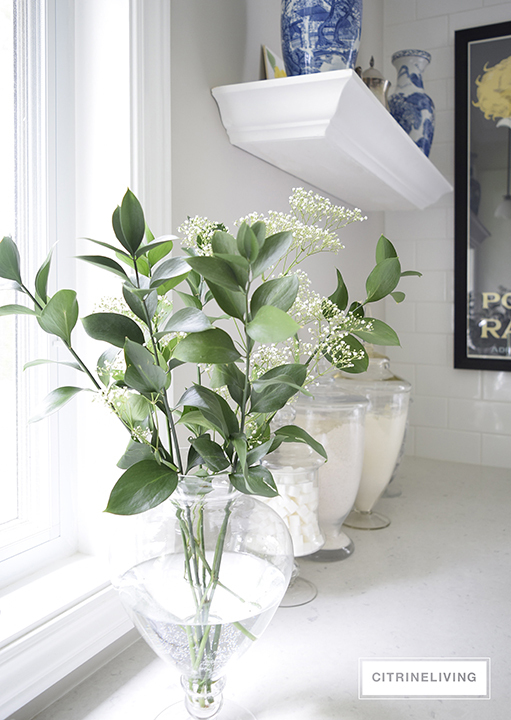 A few greens and baby’s breath is all you need to bring a touch of summer to any corner. 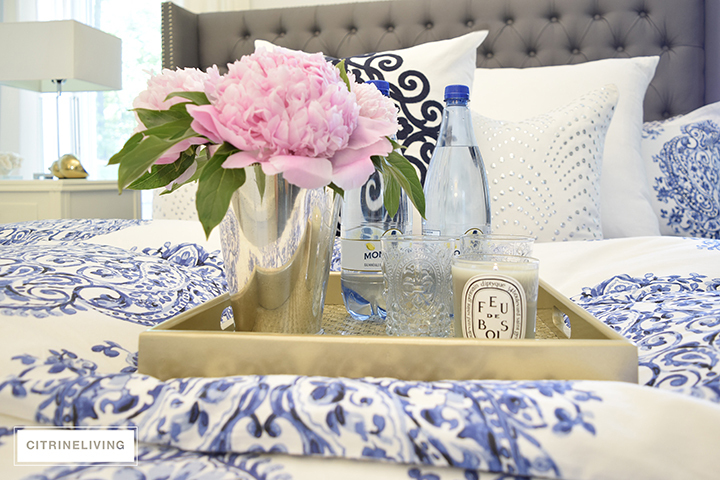 Let’s move to our master bedroom – I’ve used only the pink peonies in here. Simple, elegant and chic. 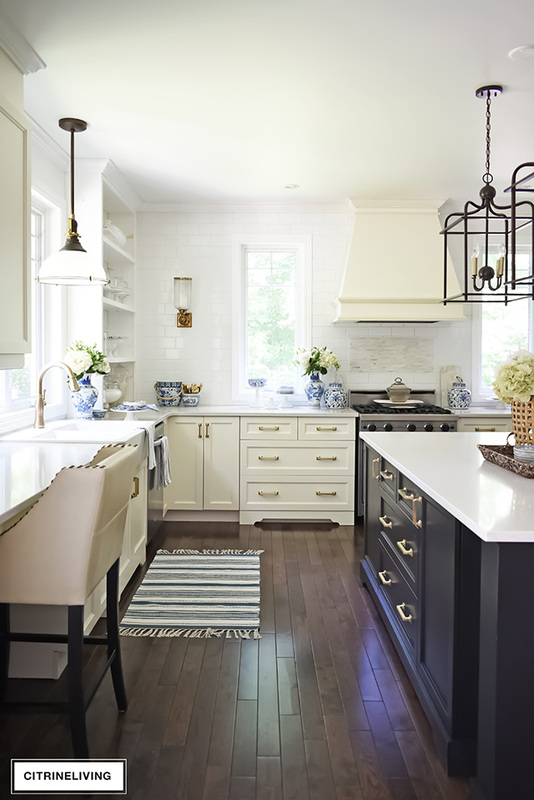 I absolutely fell in love with the pink, with our newly updated blue and white color palette. 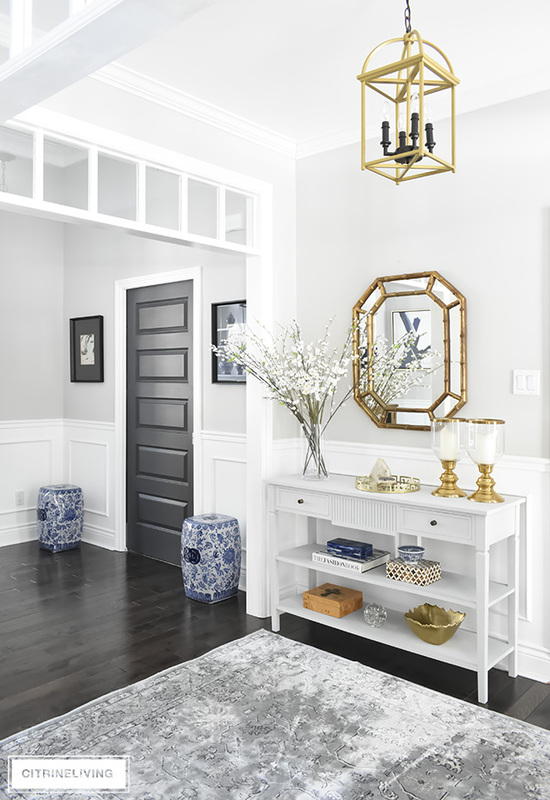 If this is the first time you’re visiting my blog, you’ll want to read about how I transformed this space from a moody, grey on grey scheme, to this refreshing, bright and crisp one. 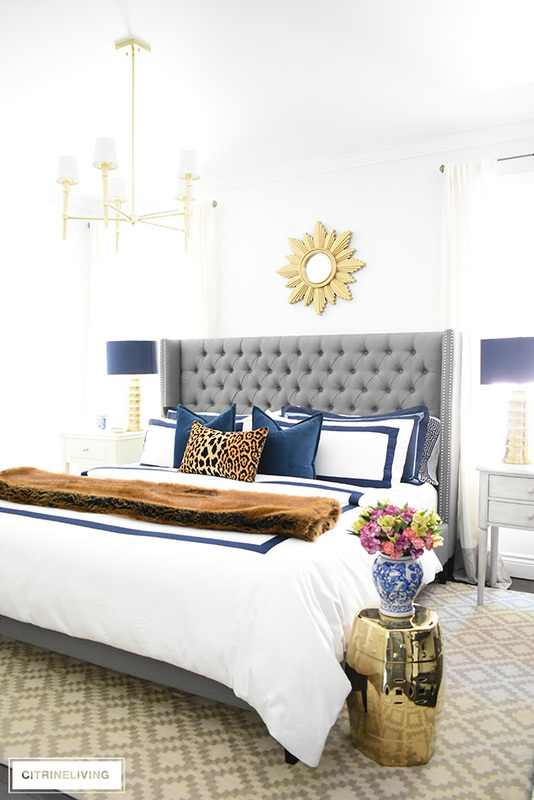 Take a peek at how this room came to be, HERE and visit our previous, grey on grey bedroom HERE – you won’t believe the difference. We love our new look and how it feels like a vacation getaway every day – just in time for the season. 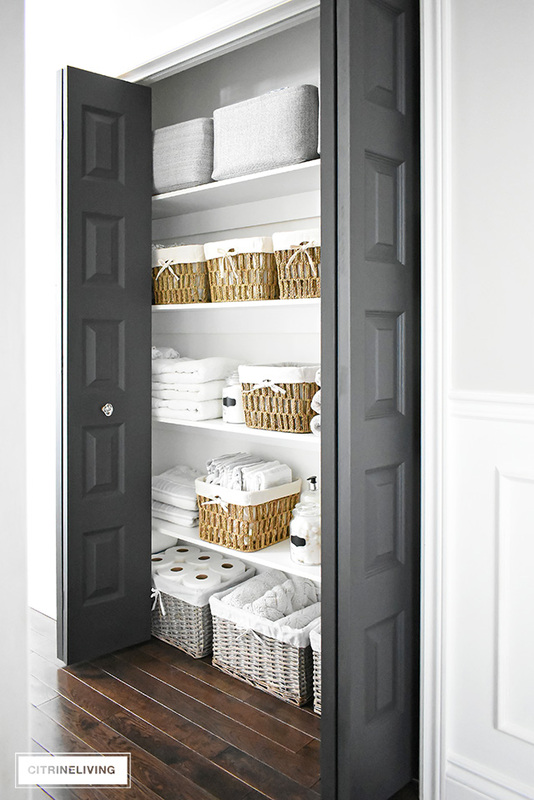 We welcome overnight guests at times during the summer and it’s typical for our bedroom to be stocked with these small indulgences. 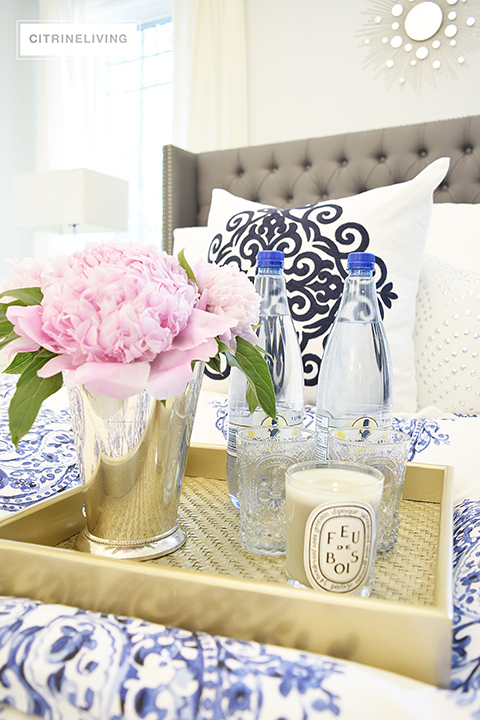 Our blue and white bedding, crisp pale blue walls and these fresh pink peonies are perfect for Summer relaxing and sleeping. Waking up in here each morning is so invigorating and refreshing. 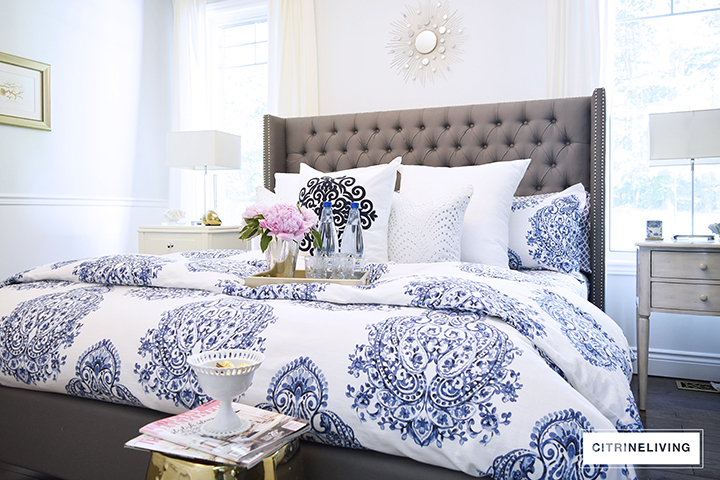 Nothing starts a new Summer day like a good night’s sleep! That wraps up my Summer Home Tour. Thank you so much for stopping in to visit – I hope you enjoyed it! I’d love for you to come back again! Sign up for the CitrineLiving newsletter and you’ll always be informed of the latest updates. Next stop on the tour is Brittany, of Addison’s Wonderland. You will absolutely love how she works her magic! Don’t forget to visit everyone on the tour as well, listed below. Thank you again for stopping by – I’d love to hear from you, leave a comment below! Tam! This is just PERFECT as always! 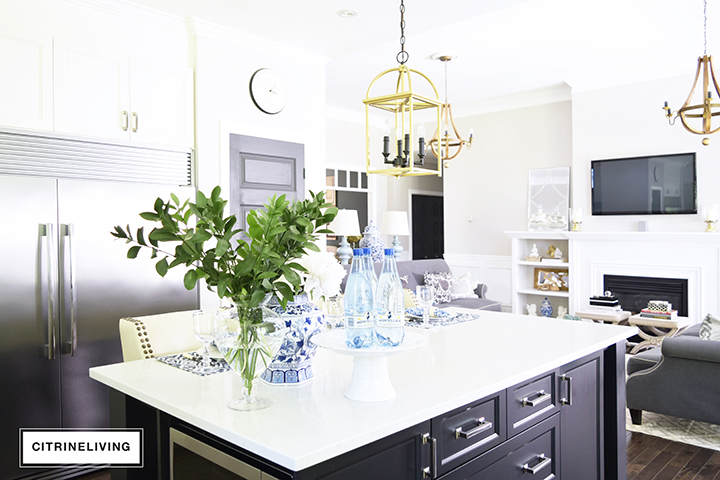 You did such a great job styling everything and your backyard looks dreamy!!! So beautiful, Tamara! Love it all!! 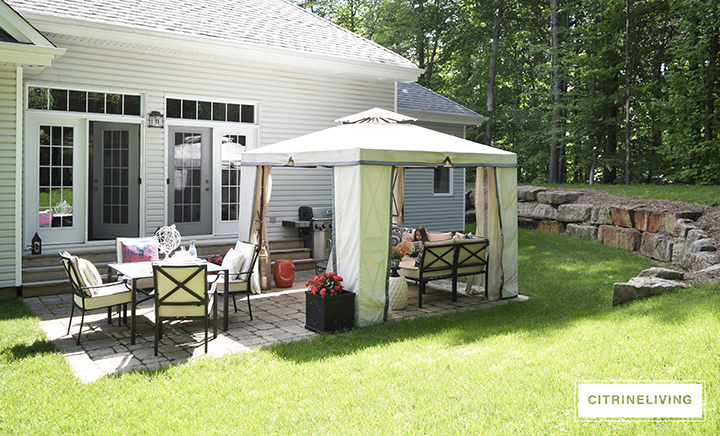 Wow – that backyard is what dreams are made of! Gorgeous! 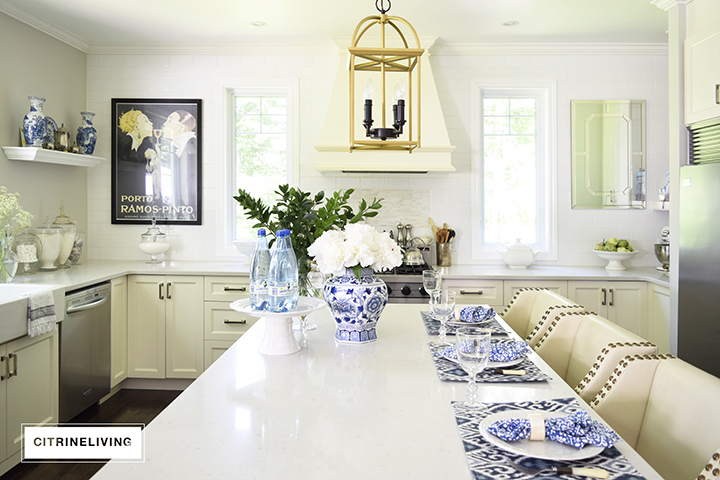 Love all of your classy, pretty details – such a beautiful house, Tam! 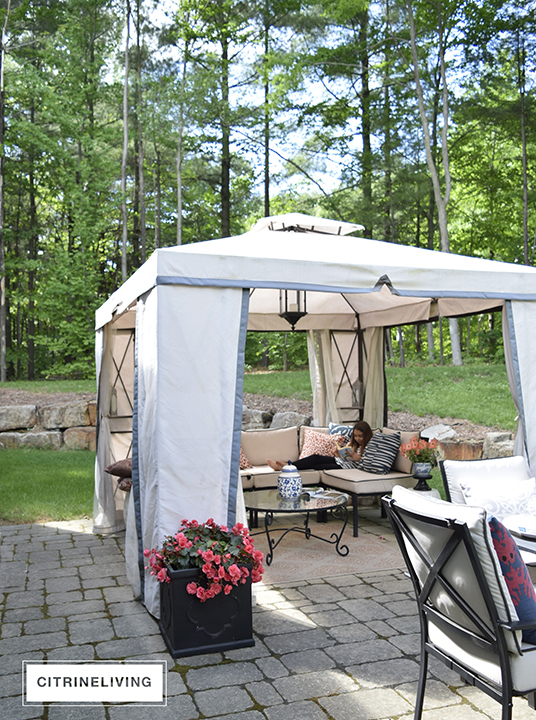 Your back yard space is a gorgeous sanctuary! How dreamy with all those trees and horses just trotting by! You make me want to run out and buy a bunch of blue and white too! Looks so fab in your home Tam!! Love it so much!! Every bit is gorgeous! You are a wizardres, for sure! 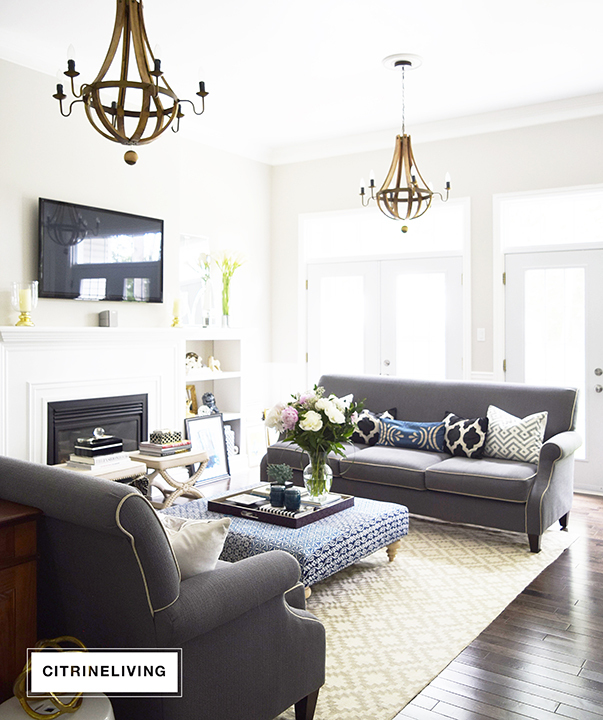 Thank you for the invite to see your beautiful home in Summer! Tamara your backyard is incredible and I love how you have it ready for summer. This tour was gorgeous, each and every detail! !